This great new knife is built as a multipurpose knife for hunting, bushcraft and general use in the great outdoors. The blade is 10cm long and made using 3.8mm thick Swedish 14C28N stainless knife steel and heat treated to achieve a hardness of 57-59 HRC. The knives are ground with a shaving sharp flat Scandinavian grind and have a satin finish. This steel in combination with the grind makes these knives very strong, yet very easy to sharpen and it takes a great edge. 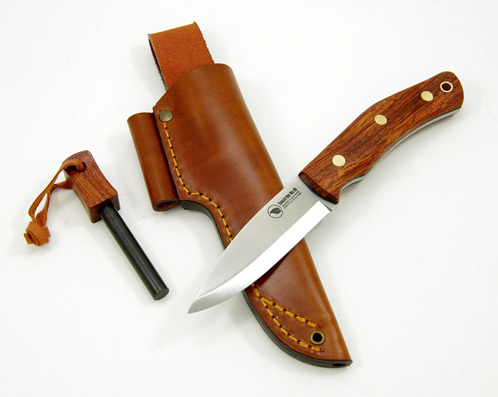 The handle is available in Classic Oak, Bubinga, green linen Micarta or curly birch. There are black liners between the handle scales and steel to enhance durability over time. The wood has been treated with a traditional Scandinavian linseed oil based varnish. Sandvik 14C28N is the latest development in Sandvik's range of knife steels. Optimized chemistry provides a top grade knife steel with a unique combination of excellent edge performance (stability and ability to take an edge), high hardness and good corrosion resistance. This new grade allows for better hardness and wear resistance to previous grades without affecting the microstructure. Blade re-sharpening is therefore easy. At the same time, edge stability in terms of microchipping and edge folding or rolling is also good.